The polyphemus moth is one of the largest and most beautiful silk moths. It is named after Polyphemus, the giant cyclops from Greek mythology who had a single large, round, eye in the middle of his forehead. The name is because of the large eyespots in the middle of the hind wings. 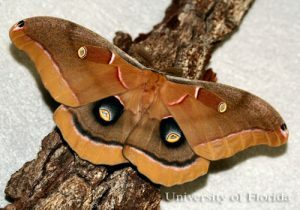 Polyphemus moths are the most widely distributed large silk moths. They are found from southern Canada down into Mexico and in all of the lower 48 states except for Arizona and Nevada. The adult wingspan is approximately 4 to 6 inches and the upper surface of the wings is various shades of reddish brown, gray, light brown or yellow-brown. The large hind wing eyespots are ringed with prominent yellow, partial white and black rings. The polyphemus moth adults may be found during every month of the year in Florida. Attached longitudinally and permanently to a twig so that the cocoon does not fall to the ground during the winter. Attached apically by a silk peduncle to a twig. 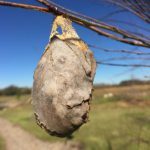 Peduncle may be weak, allowing cocoon to fall to ground during winter, or strong so that cocoon remains on tree all winter. Attachment by a peduncle may be more common in the South. Attached among leaves on trees but with no peduncle so that most fall to ground during winter. Spun on ground among fallen leaves, grasses or herbs. 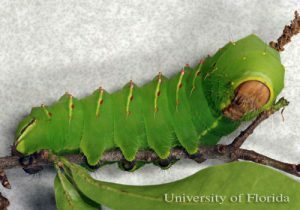 Polyphemus caterpillars are never sufficiently common to cause significant damage to their host trees. (They were found on river birch in the Exploration Gardens). Cocoons hanging in trees are susceptible to attack by squirrels and woodpeckers. We are watching our cocoons carefully, hoping to see the dramatic emergence of the Polyphemus moth! More information on the Polyphemus moth can be found here. ← What Caused This Severe Nutrient Deficiency on Pygmy Date Palm?